I was squealing with excitement when I first received these products! Especially.... THE PLAY101 series OMGGG! Following the launch of the extremely well-received PLAY 101 Pencils, the PLAY101 stick is in a much thicker and creamy form, more suitable for areas like our eyelids and cheeks and I would even recommend for contouring! The Berry Delicious series is also squeal-worthy... I mean... look at the cute packagings and colors!!! For this blog entry, I will just be concentrating on talking about the PLAY101 series as well as the blushers and lippies from the Berry Delicious range! Courtesy of TouchPRAsia, I was sent 4 shades of the PLAY101 stick to try out. There's the #14, #15, #11, Foundation Stick Shade #3. Shades #14, #15, #11 are recommended to be used as eyeshadow/blusher as compared to the Foundation Sticks. Upon application of the Foundation Stick, I find it a little too drying on my skin and it just sits on my skin. It doesn't blend in too well and I am not very impress with it. For coverage, it is still alright, certain blemishes and my dark eye rings can be covered minimally. For PLAY101 Stick #14, #15, #11... I LOVE THEM. I love how the colours shows up lightly on my skin tone, and I just simply layer up when I need more. So far I have created 3 looks using these 3 shades and I just can't get enough!! I use it on my eyelids and a little bit of the same shade on my cheeks as blusher. like burgundy pink - PERFECT FOR SPRING! Notice how the orange pops but still looks really sweet and soft? This is the kind of shade that I'm into, and PLAY101 #15 did it sooooo well! I use this shade for slight contouring of my cheekbones and also on my eyelids. 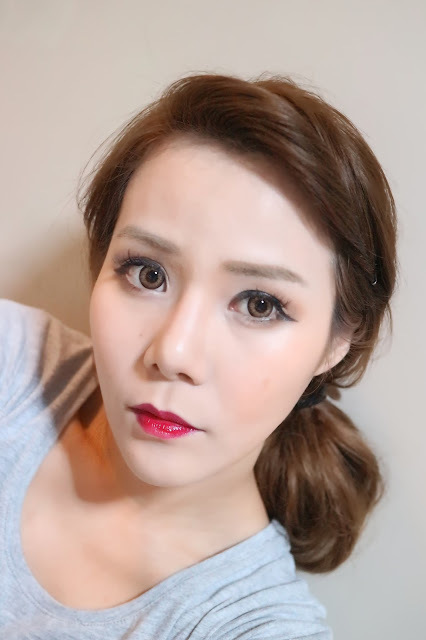 I actually wanted to go for the smokey-eye look (Koreans use very light shades of browns for their smokey-eye looks) but somehow this shade does not show very well on my skintone. I'm hoping to find another product to mix the colours with for a more "smokey" effect. Tip : When using the PLAY101 Stick, I do notice that the creamy texture sometimes do smudge especially when on top of BB cushions/foundations. Dust a little bit of powder over it after application so it will last longer. Blend well to avoid creases. When Pony, korean Youtube make-up artist/celebrity raved about this, I know I MUST TRY THIS. So thankful this was included in the media kit TouchPRAsia sent! 'Contour Duo' as they call it, so definitely there will be a darker shade for contouring and a very light shade as highlighter! What I really like about the PLAY101 range is that THEY DON'T MELT. Yes they don't, especially if you make an effort to dust loose powder after finishing our makeup, I can assure you they don't! This one though, I have some issues blending and find it works better blending with a brush. In fact, all products under this range I feel work better with a brush than our fingers. For the darker shade, it seems a little too dark for me and it does take me some effort to blend it in. While Pony applies it in one stroke in her YT makeup tutorial, I prefer to apply it in dotted lines/motion. What really interest me about this one is the mechanism itself. It works like a pen, literally, and you just have to click the end of the "pen" over and over to get the product out onto the sponge applicator. It blends easily and I love how it doesn't dry up too quick and cause unslightly patches. In fact, I feel that it is currently one of the better concealers that I've used, especially when I wear BB cushion. Dark eye circles covered and no creases! I don't understand the term "cream" in this context.... because the blusher is NOT OF CREAM TEXTURE AT ALL! It is in powder form! It is pretty pigmented and my favourite has got to be Shade #3 as I prefer to go light on my cheeks! But otherwise, the colour stays till the end of the day and does not run! This has got to be one of my favourite Etude House products, EVER. When it comes to lippies, I have everything from jars to tubes to sticks to even the pen ones. But apparently.. it is so so difficult to find one that fits all these criterias! Beautiful shades with a super comfy sponge applicator, these lippies are a MUST-HAVE and I was surprised at first when they came in liquid form. The colours are sooooo pigmented they literally stain my lips and even after drinking or eating, the colour still stays and I was super impressed! Upon application - looking fresh and JUICY! After washing with Cleansing Milk... colours still stay! So.... which is your favourite look? All products can be found in Etude House stores around Singapore. Thank you once again for sending these amazing products over, TouchPRAsia!